"While the likelihood of Apple releasing new iPhones this year is all but certain, a discussion between analysts and Apple's top brass has also dropped clues that the iPhone's pricing may not be static this year. "Toni Sacconaghi of Bernstein Research mentions in a research note that a discussion with Apple COO Tim Cook, CFO Petter Oppenheimer and worldwide marketing senior VP Phil Schiller point both to an upgrade to the touchscreen device as well as to the possibility of 'different pricing/price points' this year, with Cook 'examining iPhone's business model' for possible changes...."
"Google on Wednesday demonstrated how a future version of Gmail could soon run offline on mobile browsers compatible with HTML5, including the iPhone's mobile Safari browser...."
"[Some Japanese] papers have . . . collaborated on a new effort to bring their content to the tech-obsessed youth. Last week, the three collectively introduced an iPhone/iPod touch application which delivers the cover stories, city news items, editorials, and pictures to the owners of Apple's smartphone. "The application is unique as it lets consumers browse and compare the coverage of news stories by the different papers all within one single interface...."
"Saudi mobile operator Mobily notched up 25,000 subscribers within hours of its launch of Apple's iPhone 3G in the kingdom. "'In just a few hours of launch the number of walk-in customers and those who applied online reached 25,000,' said Ali S Al-Dakhee, Mobily's youth segment manager in comments published by Saudi Gazette on Monday...."
Short video showing the interacting devices (Apple wireless keyboard, iPhone, communicating over Bluetooth) in operation. "...I received a first generation (1G) iPod touch from my beloved wife. At the time, the only bummer was the fact that the second generation (2G) touch had the ability to use a microphone. "My dreams of using a WiFi phone to lower my cell phone bills would have to wait. "Not so fast, pilgrim. Last night I talked to my brother (six states away) over Skype using my iPod touch. The conversation lasted over a half an hour. "It was not without flaws. I could hear him fine, but my low voice wasn't as audible to him. Due to some delay issues, we had to be careful not to talk over each other. But since the call was mucho, mucho less expensive than using a landline or cell connection, I can't complain much. "How did I set up my 1G touch for Internet phoning?" "Dave Dederer, former singer and guitarist for nineties hitmakers The Presidents of the United States of America, has fashioned quite a second career for himself as the vice president of business development for Melodeo, which makes nuTsie, a software application that can stream your iTunes playlists to any web-connected PC, your Blackberry and your Facebook profile. "Dederer has neatly dovetailed his past and present with Melodeo's release of a $3 app for iPhone and iPod touch, which contains the four Presidents of the United States of America albums whose rights are owned by the band. The app includes rare, exclusive material that can be updated from the server side." "You have an iPhone? Good for you. I have a satellite phone, so how's that? Some claim that not all iPhone owners bought their smartphone because of its fancy user interface or because of its ergonomics, but simply for bragging rights instead. And for those users, the iPhone may soon be old: Iridium has launched a new promotion targeted at rival Globalstar that brings a satellite phone within reach of average consumers for the very first time. The question is: Will the mainstream market bite?" Link: PR: Angered by the million dollar bonuses, corporate jets, fancy junkets, and other executive perks funded by the Bank Bailout? Wish you could stop this "Bailout Bonanza"? An upcoming iPhone game will give you the opportunity to do just that, and in the process, provide a real helping hand for people in need. 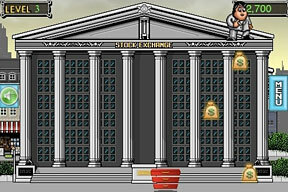 Link: PlayScreen has created "Bailout Bonanza," a fast, fun and furious arcade-action game where you try to catch bundles of cash being thrown by a greedy executive. Taking advantage of the iPhone's cool control features, "Bailout Bonanza" gives you the option to play by swiping your finger across the screen or by tilting the phone. Watch out for the occasional shoe toss! If you miss a moneybag or get hit by a shoe you lose one of your baskets and make the greedy exec very happy. PlayScreen is pledging to donate 5% of each sale to The United Way. 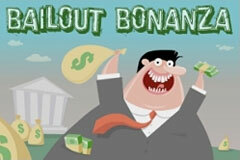 With "Bailout Bonanza" you can channel your frustration over Bailout abuse into helping the people hit hardest by this economic crisis. "You now can practice the skills of a corrupt Chicago politician, thanks to a new game that appeared Thursday on Apple's iTunes App Store. "Inspired by the saga of the ex-Grifter Governor of Illinois, Milorad 'Rod' R. Blagojevich, Yanki.jp's iPhone and iPod touch game, Pay2Play, gives you 30 days to 'pay back the unions, make tons of cash, and get out of town before getting impeached.'" PR: PropertyTracker announces Property Evaluator 2.3, an update to their real estate analysis tool for iPhone and iPod touch. Designed to leverage the iPhone's unique abilities and interface, Property Evaluator is a powerful analysis tool for investors, real estate agents, lenders or anyone who needs to take the guesswork out of evaluating investment properties. Property Evaluator 2.3 is currently on sale for $4.99 (reg. $9.99) through the end of February and available exclusively through Apple's App Store. PR: wuonm introduces Canvas 1.0, their first in a painting lessons series for iPhone and iPod touch. Designed specifically to leverage the iPhone's unique abilities and interface, Canvas is a series of step-by-step painting lessons. Discover the process of creating a real painting. Renowned artist Manuel Sosa guides users through every step in the creation of works of art, from outline to finished stage. Slideshow the whole sequence of the full picture or just a section. Canvas 1.0 for iPhone is $2.99 and available exclusively through Apple's App Store. PR: The iPhone has now evolved in to a fully featured defense weapon. With Diversion from Marvel Apps, LLC, users can distract others with over twenty five different sounds varying from ear piercing tones, sirens, horns, and the useful fake phone call. Add some humor and excitement wherever you are with Diversion, recently released for Apple's iPhone by software developer Marvel Apps, LLC. Diversion contains a library of over twenty five unique sounds that enable the user to distract or annoy people on demand. The app also can be used as a motion alarm to prevent theft and also features a fake phone call feature to help you get out of that tough spot. The application features many different sound effects including ear piercing tones, buzzes, whistles, alarms, sirens and more. Lighten up class, a business meeting, or use the LED countdown timer to set Diversion to go off and walk away to scare an unsuspecting victim. Bill Leisenring, President of Marvel Apps, said "This app has more depth than similar apps that are available. We wanted to provide more than just a grenade in the user's sound arsenal. These sounds range from funny to truly disturbing." Leisenring also commented on the different features of the app, "The app has a lot of depth for this price point as it also can be used as a motion alarm for thief protection, has a fake phone call feature, and a countdown timer feature. Finally, we wanted a design that invoked panic and I'm sure Jack Bauer could definitely put this to good use. A demo of the app is featured on our company's web site and the feedback has been great." The application is 50% off in the month of February and is available for $0.99. This is the second sound effects app for Marvel Apps. Diversion utilizes some of the code from the first sound app, Golf Smak! "We leveraged Golf Smak! 's randomness logic in order to avoid the sense of repeats." said Leisenring. "We also added the ability to select a sound directly which has been requested for Golf Smak!" The Smak! franchise has more in the works as well with Office Smak! currently in Apple's approval process. In addition to these applications, Marvel Apps has also released Fandora's Box 2008 Summer Games, iLove Fantasy Football '08 and iLove College Football '08. Their applications are available in Apple's iPhone App Store. This app has more depth than similar apps that are available. We wanted to provide more than just a grenade in the user's sound arsenal. These sounds range from funny to truly disturbing. Marvel Apps, LLC's mission is to create the best user experience in web and mobile applications. In doing so, customers can 'Expect the Extraordinary'. This is not a tag line. Rather, it is the Marvel Apps corporate identity that is fueled by the knowledge, experience, and passion of the Marvel Apps team. Copyright 2009 Marvel Apps, LLC. All Rights Reserved. Apple, the Apple logo, iPhone and iPod are registered trademarks of Apple Computer in the US and/or other countries. PR: Olive Tree Bible Software announces a new commentary,Strong's numbers on iPhone and BlackBerry, and updated files for two Bibles this month. 2009 is the 500th birthday of Protestant theologian John Calvin. Celebrate by downloading Calvin's Institutes of the Christian Religion for free. Olive Tree introduces two new commentaries by pastor and prolific Bible study author Dr. Warren Wiersbe. Wiersbe's Expository Outlines on the Old Testament and New Testament offer rich textual study that leads a reader through all parts of the Bible. This title is new this month for all major Olive Tree platforms: iPhone, Palm, Windows Mobile Classic (Pocket PC), Windows Mobile Smartphone, Symbian, and BlackBerry. Are you interested deepening your understanding of God's Word, even amidst a hectic schedule? Check out these Bible commentaries and study tools for your mobile device - perfect for reading and study, even when you're on the go. See the complete list of Bible Commentaries available at Olive Tree. The newest version of BibleReader for iPhone is now available on the iTunes store! Version 4.05 supports Strong's numbers. We're also proud to release two Bibles with Strong's numbers for iPhone! You can purchase them exclusively at OliveTree.com or download them from your Personal Library if you've purchased them in the past. Along with Strong's numbers, Version 4.05 also features popup windows that you can use to show publisher's notes, Strong's hyperlinks, and Bible hyperlinks. Popups are great because they let you read additional information about the text without navigating away from the page and losing your place. They're also easy to dismiss. Turn popups on or off, change the colors, and choose which items open in popups and which don't. This feature is fully adjustable, so you can display information in whatever way suits you best! Interested in upgrading your iPhone BibleReader to version 4.05? All BibleReader Apps on iTunes have been updated to version 4.05. Visit iTunes if you'd like to upgrade your previously purchased Apps for free. Want to get a feel for what these new features look like on your iPhone? We've created a free demo so you can test out Strong's numbers. What BibleReader features do you want on your iPhone? Help shape the future developments for BibleReader on iPhone by taking this survey. You can also read the blog article from engineer Stephen J. to learn more about Olive Tree's plans for future development and to hear why we need your input. We'd love to know your opinion! Strong's Numbers Demo for iPhone and BlackBerry - Free! Want to try out the newest feature of BibleReader 4.0 for free? With this demo, you can test how Strong's numbers work on your iPhone or BlackBerry! Download New American Standard Bible (NASB) Free Demo with Strong's Numbers. It contains the book of Galatians, along with all the Strong's Dictionary entries corresponding to that portion of Bible text. See what Strong's numbers can add to your study of the Bible and experience this new feature on your handheld device. New to Strong's numbers? Named for their creator, Dr. James Strong, and first published in 1890, the Strong's number system maps every word in the Bible to its original language - a root word in Greek or Hebrew. This tool can reveal similarities in words or ideas and layers of meaning in the original text that aren't always apparent in modern-language translations. Download Bibles directly to your iPhone by following these step-by-step iPhone instructions. 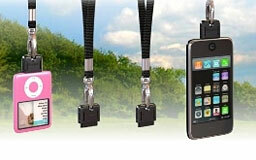 Link: PR: If you are a journalist and using iPhone 3G, you probably would like to small gadget. Link: PR: Collins America has begun accepting orders for its patent pending Danglet wrist and neck strap system for Apple's iPhone and iPod products. Our warehouses in the United States and Europe are stocked and ready to ship orders placed from the Collins America web site to buyers in the US, Canada, and EU countries. Priced at $14.99 (plus shipping), the Danglet is the world's only strap adapter for Apple's iPhone or iPod that allows use of any standard clip-on, snap, or string-tied wrist or neck strap. Danglet orders include the rugged Danglet adapter which clips securely into the iProduct's dock connector jack, and two sturdy black Nylon with metal clips straps, one a 7-inch wrist strap, the other a 17-inch neck strap. Additional product information can be found on the Collins America web site. Collins America is seeking resellers for the Danglet located in the USA, Canada, and EU markets. For reseller information please email Collins America at info@collinsamerica.com. Press inquiries can also be directed by email to info@collinsamerica.com. It's a unique product that offers a helping hand for those trying to juggle a mobile electronic device while trying to relax on a plane trip. 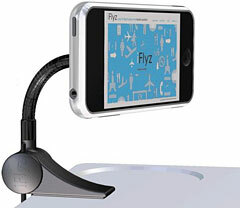 The iFlyz device is an in-flight, handsfree solution designed specifically for air travelers. The iFlyz's suction cup firmly grasps any device relieving the strain of holding it for long periods of time while watching a movie, surfing through music or reading online. 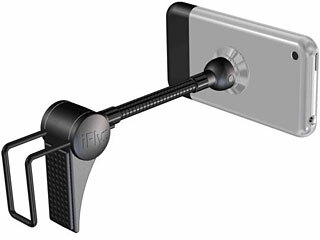 The iFlyz device uses an adjustable clamp to attach to either an upright and locked seat tray or one that is open during drink or dinner service and has a flexible gooseneck that allows the attached mobile device to be turned any angle or direction. Link: iFlyz has a simple three step process: attach your phone or media player to the iFlyz suction cup; clamp it to a meal tray in either the stowed and locked position or unlocked and down position; and simply adjust the flexible gooseneck to the ideal angle. The product is simple, durable and compact; ideal for anyone constantly on the go. 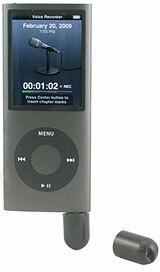 It is compatible with iPhones, iTouches, iPods, BlackBerrys, SmartPhones, and PMPs of various brands. The iFlyz is 5.5 inches long and 2.5 inches wide, and weighs only two ounces. The iFlyz eliminates the need for such makeshift efforts. The idea for iFlyz came as a way to make life easier for travelers trying to relax. "Being an early iPhone adopter and frequent flyer, I took note of all the other users on my weekly flights taking advantage of their time in the air to catch up on their favorite movies and TV shows," said Alastair MacGregor, iFlyz International CEO. "It was immediately evident that I wasn't the only person loving the new technology but hating that I had to hold my device to be able to watch any video content." MacGregor says that while there are a few multipurpose device mounts or cradles on the market, the iFlyz is the only one designed specifically for air travel and the only one that works with the tray up or down. iFlyz sells for $29.99. Link: PR: Exclusively designed by Proporta, the Wallaby Wallet (4G iPod nano) offers everything you'd expect from a high quality wallet, with some intelligent little extras. A custom made pouch helps keep your 4G iPod nano safe and sound, whilst clever cutouts mean you can use your device without having to take it out of the wallet. Handcrafted from the finest quality black leather, the unique Proporta Wallaby Wallet features an attractive lime green lining and elegant contrast overstitching. 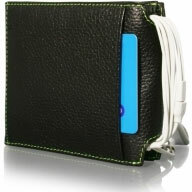 Underneath the beautiful exterior, there are sections for all your bank notes and cards, a custom made pouch for your iPod nano, and a special design so that you can wrap your headphones around the spine of the wallet to keep them knot-free. It's a stylish and simple way to keep all those valuable essentials close to hand, and it looks great too. And If you' re a regular jet-setter or even just a casual traveler, protect your passport from scuffs and bending with the stylish Proporta Passport Holder, and be the envy of everyone in the departure lounge.